Future Lion winners join current Lion winners. 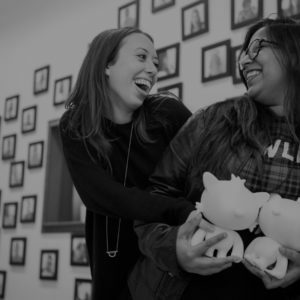 We couldn’t be more excited to announce the hire of junior creative team Divya Seshadri and Meghan O’Neill. They’ve only been at Heat for three weeks and have already proven themselves invaluable. They jumped into the fire (see what we did there) and lent a hand on new business and our big time existing clients including Hotwire. Divya and Meghan both double as art directors and writers. Honestly, we’re a little intimidated. They’ve put this immense talent to work for brands like eBay, Victoria’s Secret, Gillette, Advil, and they’ve even been honored as Cannes-acclaimed Future Lions Winners for Heineken International’s “SafeStamp” campaign. We’re very much looking forward to seeing what they create for our clients here at Heat. In her off time, Meghan enjoys building her arsenal of “your mom” jokes. Divya uses her time perfecting her Harry Potter knowledge. And yes, she knows more than you about all things Potter. Don’t believe us? Stop by some time and challenge the December ’09 Muggle Net Fan of the Month to some trivia. Lumos.